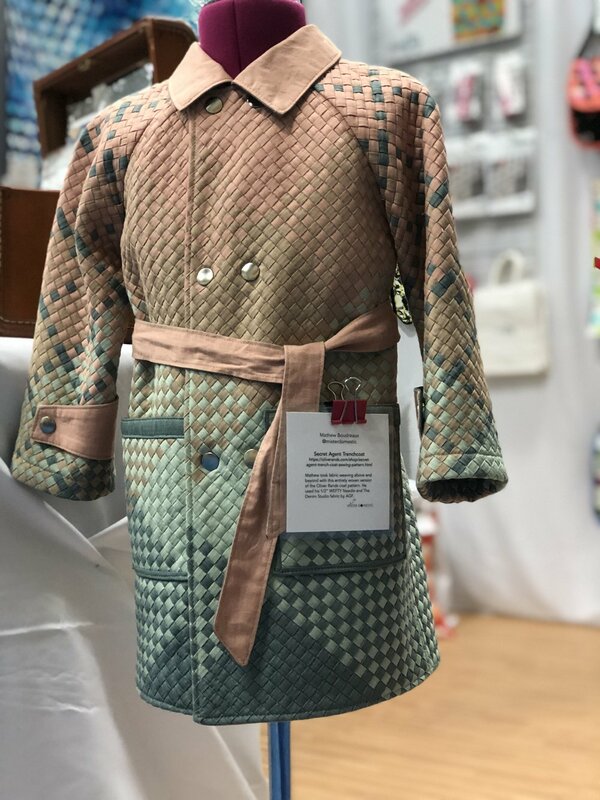 WEFTY at International Quilt Market, Spring 2018, Portland Oregon. International Quilt Market is a trade show held two times a year. It is the only wholesale trade show for the quilt industry, and exhibitors must be wholesale suppliers of needlework, quilting, or soft work products. Learn more here. Ever since WEFTY opened its doors almost three years ago, people have asked, "Will you be at Market?" I thought Market was for the big dogs, not a one-woman show like mine. It seemed like a whole lot of work, a whole lot of cost, and a whole lot of leaving the house and being on display. In a word: Scary. I was way too scared to want to take that on. I had also been reading some interesting perspectives on the relevance of International Quilt Market in an increasingly online industry. I wasn't sure it would be worth it for me. When I learned that Mathew AKA Mister Domestic (who is one of my best friends and also a member of my chosen family) would be at Spring Market in Portland introducing his debut fabric line Loved to Pieces for Art Gallery Fabrics, I told my husband Donald I needed to go for at least one day and see him at his booth. Donald told me I wasn't going unless I had a booth for WEFTY. He shared some important feedback about my resistance to Market equating to resistance to growth. My choices: bite the bullet and work really hard and invest in a booth OR not share in a huge moment with someone I value. Long story short, I went to Market. I had a booth. I saw Mathew introduce his debut fabric line and all the things you can sew with it. I got to give big hugs to him and other loved ones who have supported me over the last few years, and that felt really good. I was able to weave for people and talk with them about the tool my husband and I developed together. Donald and I bonded and discovered strengths in one another we hadn't seen before. I got over my fear of Market and had a great time. What I'd like to talk with you all about is whether or not it was "worth it" and what, if any, relevance International Quilt Market has in our increasingly online industry. And this comes from the perspective of a tiny one-woman show who is entirely web-native. If you, like me, love spoiler alerts here is one: It's worth it. World famous woven trench coat by Mister Domestic! I want to share with you some of the things people said to me that let me know being there in person was important for the trajectory of my business. "I just needed to SEE it..."
Donald and I stood in the booth doing WEFTY weaving demos for three days. People may have seen weaving online, but this was their first opportunity to see the WEFTY Needle in action, and to see how easy weaving is. My husband let people weave with him. I rented a booth in "Demo Alley," which was a designated area of the floor where a row of us did demos as shop owners walked through. If you look at my Square reports, there is a spike in sales each day during and right after Demo Alley. Nothing convinced me more than my demo of the EZ Miter, as before that demo no one gave a hoot about it. After that one hour of demos, and for the rest of the show, we sold EZ Miters and had lots of questions about it. "You have a good nature about you ... let's make this work." I've been trying to work with business owners on projects over email and phone, and we have struggled to make it past the talking stage. Two owners in particular were able to meet me and know I'm for real and can back up the numbers I quote. They got a look at the products I wanted their help on. This in-person interaction cannot be underestimated. "Thanks for explaining that! I didn't understand it when I read it." Shop owners were able to buy-in to weaving and the EZMiter. They could envision demos happening in their shop, how they would display samples, what language they would use to explain the product, and what products they would sell alongside of the WEFTY products. "Here's what other people do..."
I got so much invaluable feedback on how I can work with shop owners and buyers! Constructive criticism, ideas, inspiration, advice ... I'm ready to implement several great changes that will make me more marketable and successful. There are those in this world who can't accept feedback without being defensive. If you're like that, bless you, but don't go to Market. Shop owners are WISE. They are EXPERIENCED. They are INTELLIGENT. And by gum, they are OPINIONATED. If you don't want to absorb as much as they'll give you, first of all you're nuts, but second, don't put yourself in a booth at Market because you're going to get this feedback whether you want it or not. And if you act hurt or annoyed you'll look bad and ruin a shot at potential business. Not to beat a dead horse, but I want to this to possibly help someone. I see people flounder in their creative businesses and I know resistance to advice can be a big reason for that. If you have feedback for me, here's how I look at it ... you've wrapped up a piece of gold and gifted it to me. All you ask in return is that I turn that gold into something. My job is to thank you and find a use for it. "You weren't in your booth..."
I'm introverted and easily distracted. I disappeared from my booth a lot I guess, though I felt like I was there the entire time. People approached me to let me know that they wanted to learn from me, buy from me, talk with me, etc. and needed me in the booth to do that. What I learned from this was the importance of having someone in the booth at all times. Have an extroverted person on board who gets off on interaction. But also know that people may need to talk with you before buying, so be around. I learned that if I do another Market, I will reserve the last 15 minutes of each day to explore and have specific areas mapped out to tackle, and spend the rest of the time planted firmly in my booth. Sherry Shish, AKA Powered by Quilting, is a blogger and pattern designer. Schoolhouse: Do a schoolhouse talk. Those in attendance will share with others what they learned from your talk. The people who attended and those they talked to will come find you at your booth. Grow Your List: Collect business cards at Schoolhouse and at your booth by offering a giveaway if they leave their card and agree to be added to your newsletter. Demo Alley: This really only applies to those of you who have a product or technique you're selling. But if you do, Demo Alley is all there is and then some. Do it. Sample Spree: I did not do Sample Spree because I wasn't ready. Next time I will. It's a great way to get a sample pack in front of people and they want that. Something to play with, think about, take back home to their customers, etc. I know from the feedback I got that this would've been good for me to do. Companion Products: reach out to companies whose products work well with what you're doing and ask if you can share their stuff in your booth. Will they have a booth there? Ask if you can have your stuff for them to share in their booth. Just one eye-catching sample or product can make a difference. Sherry Shish: Do you have a Sherry Shish? You need a Sherry Shish. Mrs. Shish, or Powered By Quilting as she's known, was visiting Market as a blogger and carried with her this woven bag she made in one of my classes. This led to SO MANY VISITORS TO MY BOOTH. And so much business! I don't know if something like that can be staged or reproduced. All I know is she had an enormous impact on my weekend, and has earned free WEFTYs for life. The Kardashians: Don't worry so much about keeping up with the Kardashians. Maybe you are one, or maybe you're like me and are trying to save your dollars. It ends up not mattering if you have hard walls, so long as your items are clearly displayed. Modern, edgy furniture isn't as important as a clean environment. And if the furniture is too inviting, people can park it and deter business. Can people walk in and out of your booth without feeling trapped? That ends up being more important than decor. I am glad I took this opportunity to attend Market. This was a good for WEFTY in terms of sales, gaining new retailers, being picked up by new distributors, networking with publishers and other business owners, and marketing. Thanks for reading! If you have questions or feedback, please comment. I hope whatever you're working on creatively or in your business, you are enjoying the process.